​​To achieve the maximum performance and results from a front and a rear or combination mower the cutter bar and mower suspension works together to deliver uncontaminated forage. As a result McHale have developed unique patented ground adaption technology which deliver 3 dimensional ground contour tracking for its Pro Glide range of rear and combination mowers which allows an arc of movement from left to right and forward and back movement adjusting to changes in the contours of the ground. The Pro Glide range of rear and combination mowers is fitted with patented ground adaption technology which allows the bed to move back and up if the bed encounters small obstacles. This saves time and maximizes throughput as it means the obstacle does not trigger the main break back protection. This results in higher mowing speeds being able to be achieved without the interruption of having to reset the break back. If the mower hits an immovable object, it is fitted with mechanical break back which will be triggered. The Pro Glide rear suspension springs react instantly to ground contours which results in high quality cut even when working at high ground speeds. This allows the mower to easily mow on rough or undulating terrain and still deliver optimum results. On the Pro Glide rear and combination mowers the cutter bar ground pressure can be set from the tractor cab. The working pressure is visually displayed on the clock which is mounted on the headstock. Once the desired pressure is selected the cutter bar working pressure can be isolated from the tractor hydraulics with a mechanical tap. On the McHale Pro Glide range of rear and combination mowers the gearbox powering the cutter bar is located behind the first mower disc which allows the operator to mow into corners and over rough terrain with no problems occurring. For transportation, the McHale Pro Glide folds vertically to position itself behind the centre point of the tractor for safe transport. 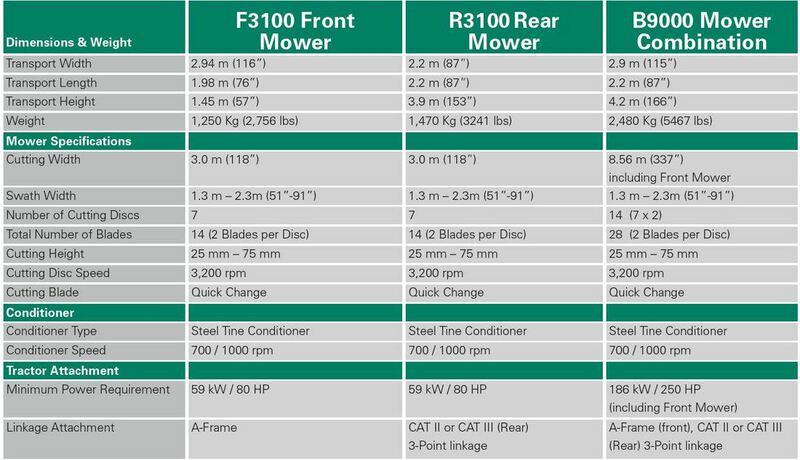 The transport height of the machine is reduced thanks to the positioning of the mower bed at 110 degree angle on the Pro Glide R3100 to measure at a height of 3.9 metres while the Pro Glide B9000 is positioned vertically in transport to measure at a height of 4.2 metres. This position allows for the center of gravity to be close to the tractor which ensures even weight distribution and stability during transport at high speeds on the road or in uneven fields. This position allows for the mower to distribute its weight across the tractor for ease of transport on the road while also providing the driver with a clear view from his rear-view mirrors.